When selecting a bridal dress you have so much to take into account. You have to think about your wedding theme, setting and your budget. But most of all you have to pick a wedding dress silhouette that looks good on you! The challenge is to choose the right wedding gown that enhances your good points and hide figure flaws. There are wedding gown silhouettes that look best on certain figure types. Also there are terms you should know that describe bridal gowns. Knowing what these terms mean will help you understand dress descriptions used by wedding dress designers and bridal shop consultants. Then you can match the correct gown silhouette to your shape. What are built in crinolines in wedding gowns? Most designers have a petticoat slip sewn into the gown to help hold the shaping of the dress. In some cases, you will not have to buy another slip, but most of the time you will find you need to purchase an additional slip to go under the attached one. Is the bustle already built into a bridal dress? It is rare but there are a few designers that will add a bustle to a gown. Most gowns will not have a bustle. What is a wedding gown silhouette? The overall shape of a gown including styling details. What is an a-line silhouette? An a-line wedding dress forms an A shape. It's narrow at the top, which can be any point below the bust to the upper thigh, and then it gradually widens out to the hem. What is a ball gown silhouette? The skirt on the gown is very, very full from the the waist seam or dropped waist, down through the hem. Has a bell shaping. Picture Cinderella's princess dress. What is a mermaid wedding gown silhouette? A mermaid shape starts around the knees and flare out wide at the hem. What is a sheath wedding dress silhouette? 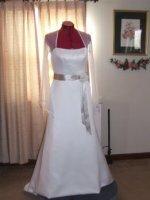 The skirt of the bridal dress will fall straight from the hips to the hem without any flaring out. This shape can be tapered at the hem. What is an empire waistline bridal gown silhouette? This style has a seam right under the bust or a few inches below it and the skirt of the gown attaches from there. What is a fit and flare silhouette? Designers use this term interchangeably sometimes when referring to a mermaid shape and a bridal gown that flares anywhere from the thigh area to the knee. What is a natural waistline? The skirt of the gown is sewn on right at the actual waistline. What is a dropped wedding gown waistline? The seam on this bridal dress is below the natural waist and can be as low as around the hip. Knowing these definitions will help you when you as you start looking for your wedding dress. Now you can find out which of these shapes work with your body shape.